The need for staying active, being intellectually stimulated and socially connected never ends. Our recreation team works hard to design engaging activities and programs to ensure our residents experience the best quality of life possible. Activities and programs at the AgeCare Sunrise Gardens are constantly evolving so please take the time to view our most recent activities calendar posted in our news and events section. 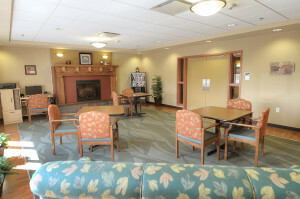 Programming is tailored to our residents’ needs and capabilities. Through these programs, residents continue to pursue leisure interests, develop new skills, enhance their self-esteem and build rewarding relationships with other residents, staff and volunteers. For our memory care and dementia care residents we provide specialized programs and activities, some of which are designed to help them rediscover old skills. Unique to AgeCare Sunrise Gardens is our inter-generational Grandfriends program, which brings residents together with schoolchildren from the adjacent Lion King Day Care. This rare and enriching partnership allows our seniors to mingle and interact regularly with the Lion King children and to enjoy a fulfilling array of programming that benefits all participants. Aptly named the “Grandfriends Program,” this blending of generations in a shared environment brings the joy of youth and optimism to our seniors and imparts the wisdom and history of our seniors to the Lion King children.